Wearing brand new matching gold buffalo lapel pins, those on both sides of the cinematic slate/clapperboard held a press conference in Niagara Square the afternoon of August 6 announcing the production of Two for One. The motion picture began filming on July 27 in Manhattan; shooting in Buffalo commenced on August 1 at various local landmarks including Robbie Takacs’ GCR Audio studio on Franklin Street in Allentown. Two for One wraps in two-three weeks, according to Matt Quinn, the film’s director of photography. 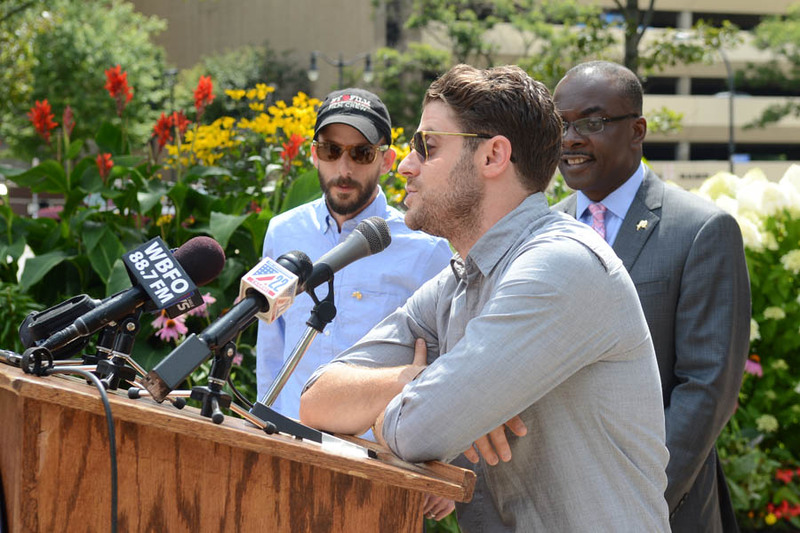 During the press conference Quinn says that his longtime friend Jon Abrahams – who co-wrote the screenplay and directs and stars in the movie – was convinced to location scout in Buffalo. Abrahams spoke of his quick love of Buffalo’s “pre-war architecture, and its post-war architecture.” “It’s also real important for me to use as much Buffalo crew as possible to get the expertise of here,” he says. “I’ve already thought of the next one I can make here, it’s been that great,” he adds. The actor’s resume includes roles in Scary Movie and Meet the Parents: he also dj’d on The Ellen DeGeneres Show 2006-2007. The “Two for One” cast includes Annie Potts (of Designing Women fame), Stephen Henderson (the movie Lincoln, several theatrical roles, and on the faculty of University at Buffalo’s Department of Theatre and Dance) and Erika Christensen (several television series). “The movie is not just being shot here, it takes place here,” Abrahams says. The plot involves a character who, post-9/11, adopts two young daughters of friends. The movie happens a decade later, over a summer, after the family relocates to Buffalo. Quinn and Abrahams used the Mayoral podium to put out a call for extras: anyone interested should email a photo to westernnycasting@gmail.com. The scenes require that people be well-dressed, for scenes showing people “having a fancy good time,” Quinn says. Abrahams praised the wardrobe of Mayor Byron Brown: “He’s a snappy dresser.” Media later asked the Mayor during Q&A if he’d take a role in the movie: he says that he will not.